Adverse immunological reactions to adenoviral vectors have significantly impacted the utility of this virus for treating genetic and environmentally induced diseases. In this study, we evaluate the effect of adenoviral vectors on an animal model of sepsis. Systemic delivery of first-generation adenoviral vectors to septic mice (cecal ligation and puncture) resulted in a shortened survival time. This effect was not observed with second-generation or inactivated first-generation vectors. The accelerated death was accompanied by a number of important changes in the disease. These changes included increased liver cell apoptosis (including Kupffer cells) and a marked increase in liver bacterial load. In the lung, the combination induced an increase in bacterial load, as well as greater lung injury. In the serum, the combination was associated with decreased TNF-α levels and an increase in bacterial load. Finally, a profound degree of lymphocyte apoptosis was observed in these animals. These observations suggest that prior exposure to first-generation adenovirus gene therapy vectors may worsen the outcome of some forms of sepsis. Adenovirus (Ad)4 is a linear dsDNA virus which has been extensively evaluated for its potential as a gene therapy vector (1). Its broad tropism, ability to transduce nondividing cells and high titer yield have made these vectors attractive choices for gene therapy applications. To date, adenovirus is one of the most commonly used viral vectors in clinical gene therapy trials (2). Recently, it has been suggested that first-generation recombinant adenoviruses might be tested for therapy of acute inflammatory syndromes, such as sepsis (3, 4). This suggestion resulted from studies that found that adenovirus constructs carrying therapeutic genes could improve the survival of animals exposed to endotoxin. These approaches involved either the neutralization or the reduction of endotoxin (LPS)-induced TNF-α production (5, 6). We were interested in the use of Ad vectors to transfer “therapeutic” genes in a sepsis model. However, in our initial studies, we found that a control Ad vector alone altered survival. Because of this finding, we altered the study to evaluate the effect of the control Ad vector on survival in a murine model of sepsis. The murine cecal ligation and puncture model (CLP) closely mimics the human sepsis syndrome (7). Therefore, we assessed the biosafety aspects of these constructs in the CLP model of sepsis. For this purpose, first-generation recombinant Ad vectors carrying two different reporter genes were delivered systemically to C57BL/6 mice. Here we report the effects of recombinant Ad vector infection on the septic mice. We found that the combination of Ad vectors with CLP resulted in a shortened survival time. This shortened survival time was accompanied by significant cell injury and an increase in bacterial load in a number of tissues, including liver, lung, thymus, and spleen. Two recombinant Ad vectors expressing either enhanced green fluorescent protein (Ad.EGFP; University of Iowa Vector Core, Iowa City, IA), or an Escherichia coli β-galactosidase protein (Ad.LacZ) (8) were used for experimental studies. Both vectors were E1/E3 deleted. First-generation recombinant adenoviral stocks were generated as previously described and were stored in 10 mM Tris with 20% glycerol at −80°C (9). Before use, viral stocks were desalted through a PBS-Sephadex G-50 (Sigma-Aldrich, St. Louis, MO) column to remove the glycerol. The particle titers of adenoviral stocks were typically 1013 DNA particles/ml. The functional titers of adenoviral stocks were determined by plaque titering on 293 cells and expression assays for encoded proteins. Typically the particle-PFU ratio was 25. C57BL/6 mice received 2 × 1011 DNA particles of Ad constructs through tail vein injections. In all cases, CLP procedures and subsequent assays were performed 1 wk after the infection. Ad.EGFP vectors were prepared as described above and then exposed to 2 J UV radiation as a thin layer in a Stratalinker (Stratagene, La Jolla, CA). 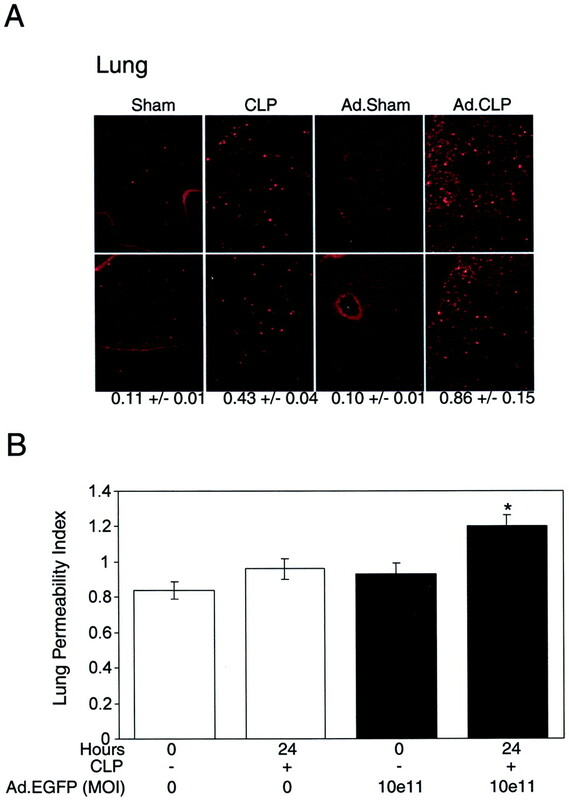 Both stock and UV-inactivated vectors were incubated with RAW cells and then viewed by fluorescent microscopy to confirm inactivation. The vectors were injected in an identical manner. After CLP, mice were monitored for survival. A second-generation recombinant E1-deleted, E2ats125 mutant adenoviral vector expressing the lacZ cDNA (10) was used to evaluate the contribution of adenoviral gene products to septic reactions to Ad. This Ad.LacZts125 vector harbors a temperature-sensitive mutation in E2a of the adenoviral genome, which significantly inhibits adenoviral gene expression. These second-generation adenoviral vectors were stored in glycerol, then desalted, and injected using techniques identical with those used with first-generation vectors. After CLP, mice were monitored for survival. CLP operations were performed as described previously (11). C57BL/6 mice (female, age 6 wk at time of viral injection; Harlan Breeders, Indianapolis, IN) were given general anesthesia with ketamine-xylazine via i.p. injection. A midline laparotomy was performed, and the cecum was identified. The cecum was ligated first with a nylon suture and then punctured with a 19-gauge needle. The abdomen was closed using a two-layer technique. Control surgeries (sham) are performed in the same manner without the puncture and ligation steps. Fluid support by the means of normal saline 0.5 ml (∼25 ml/kg) i.p. was provided during the procedure. Postoperative checks were performed every 12 h for 72 h postoperatively. Data including activity, piloerection, and position are monitored on these checks. University of Iowa Animal Care Unit postprocedural care and monitoring guidelines were followed. Lung permeability index (LPI) was calculated from the formula LPI = (wet lung weight/total body weight) × 100. Increase in LPI index indicates acute lung injury. Sera were collected by retro-orbital bleeding of C57BL/6 mice at different time points after CLP. Serum ALT measurements (an indication of liver damage) were performed as previously described (8). For serum TNF-α and sTNFR1 measurements, ELISA kits from R&D Systems (Minneapolis, MN) were used according to manufacturer’s instructions. Twenty-four hours after CLP, animals were anesthetized, and blood samples were obtained by retro-orbital bleeding. Lung and liver tissues were harvested next. Tissues were homogenized and directly plated on Luria-Bertani plates in the absence of any antibiotics. Colony counts were obtained 24 h after plating and normalized to gram of tissue. EDTA (5%) was used to prevent blood coagulation before plating. Immunocytochemistry assays for visualization of Kupffer cells were performed according to a procedure modified from that of Zhou et al. (12). Labeling of Kupffer cells was performed using biotin-labeled mAb to mouse F4/80 (macrophages, Ly-71; Caltag Laboratories, Burlingame, CA). Biotin was detected with Texas red-conjugated streptavidin under fluorescent microscopy using a Texas Red filter (Boehringer-Mannheim, Indianapolis, IN). C57BL/6 animals were perfused with 2% paraformaldehyde before harvesting liver, lung, spleen, and thymus tissues. These tissues were soaked in 30% sucrose before embedding in OCT compound (Tissue-Tek, Elkhart, IN) and sectioning. Sections were treated with 2% paraformaldehyde for 30 min followed by a 15-min postfixation in ice-cold methanol. Sections were then permeabilized in 0.01% Triton X-100. The in situ cell death detection kit, TMR red, was used to detect apoptotic cells in tissue sections, and results were analyzed by fluorescent microscopy. Image quantification was performed using Image-Pro Plus 4.1 program from Media Cybernetics (Silver Spring, MD) to determine the percent apoptotic area. Statistical analyses (survival, etc.) were performed using the Prism program from GraphPad Software (San Diego, CA) and are specifically stated in the figure legends. Efficient in vivo gene delivery is one of the most desired features of gene therapy. To assess the effectiveness of in vivo gene delivery in the CLP model, C57BL/6 mice were injected with first-generation Ad.EGFP through the tail vein. Liver sections were analyzed under fluorescent microscopy to assess the efficiency of in vivo gene delivery and the transgene expression. In accordance with the previous reports (1), first-generation recombinant Ad constructs efficiently transduced hepatic cells such that >98% of the hepatic cells were positive for transgene expression (data not shown). After successful delivery of the first-generation Ad vectors, in vivo, mortality rates for the CLP model of sepsis were evaluated after using different sized needles to perforate the cecum. In the absence of an Ad infection, a 50% death rate was observed at 24 h post-CLP with an 18-gauge needle (data not shown), and at 48 h post-CLP with a 19-gauge needle (Fig. 1⇓). Based on the need for a flexible monitoring time, the 19-gauge needle technique was chosen to compare the effects of first-generation Ad constructs on survival after CLP. Ad.EGFP-infected animals exhibited a 50% death rate by 24 h after CLP compared with 48 h with CLP alone. To rule out transgene toxicity, animals were infected with an Ad construct expressing a different type of transgene, namely β-galactosidase (Ad.LacZ). However, Ad.LacZ-infected animals also displayed a 50% death rate by 24 h post-CLP compared with 48 h with CLP alone (Fig. 1⇓). On the contrary, no adverse effect of adenovirus on the survival rates was observed in Ad-infected sham operated animals. Second-generation adenoviral vectors (ts125LacZ) did not have an effect on early mortality after subsequent CLP (Fig. 1⇓). ts125LacZ vectors, and UV-inactivated first-generation vectors had an identical effect on post-CLP survival (data not shown). These results suggested that the first-generation recombinant adenovirus constructs accelerate CLP-induced mortality in C57BL/6 mice. Effect of Ad constructs on sepsis-induced mortality. C57BL/6 mice were infected with either Ad.EGFP or Ad.LacZ constructs 1 wk before CLP surgery. The survival was monitored every 6 h for the first day and then every 12 h for the following 2 days. x-axis, Hours after CLP operation; y-axis, survival rate (% survival). Twenty animals were used for each condition (n = 20). The log rank test was used for the statistical analysis of survival curves. There is a significant difference in the survival rates between uninfected CLP animals and Ad-infected CLP animals (Ad 1 CLP) (p < 0.0001). Second-generation vectors (ts125CLP) did not accelerate mortality. Peritoneal infection results in early liver toxicity so we evaluated cell viability in sections from treated and untreated animals. Liver tissue was examined by TUNEL assay to determine the amount of apoptosis in hepatic cells (Fig. 2⇓A). CLP surgery alone did not produce apoptosis in the liver, which is consistent with previous reports (13, 14). Interestingly, a limited degree of hepatic apoptosis was observed in Ad-infected sham operated animals. CLP did not seem to increase the amount of liver apoptosis in Ad-infected animals. Therefore, hepatic apoptosis was attributed to the Ad infection itself. First-generation Ad vector delivery generated liver damage. A, TUNEL assay performed on liver sections obtained from various groups of animals as indicated above each panel. Two representatives of fluorescent pictures (TR) were provided for each group. Four animals were analyzed for each group (n = 4). The percent apoptotic area is given below each panel. B, Serum ALT levels, an indication of liver damage. Serum ALT levels were detected as described in Materials and Methods. Error bars indicate the mean data (±SEM) obtained from six independent animals for each time point. Ad.Sham, Ad infection combined with sham operation; Ad.CLP, Ad infection combined with CLP. Examination of the liver enzyme activity indicated that serum ALT levels were increased by adenovirus infection in the sham operated animals compared with uninfected sham operated animals (Fig. 2⇑B). CLP procedure further raised serum ALT levels. Serum ALT levels were maximal by 6 h after CLP in both CLP and Ad.CLP animals. Nonetheless, a greater degree of liver damage occurred in animals exposed to both Ad and CLP compared with CLP alone as determined by ALT levels. These observations suggest that the combination of Ad and CLP is more toxic to liver cells than either insult alone. The lung is often a target during sepsis, so we also evaluated cell viability in lung sections (15). Our apoptosis assays indicated a limited degree of apoptosis in the lungs of animals that underwent CLP alone (Fig. 3⇓A). Ad infection alone did not produce detectable levels of lung apoptosis compared with sham controls. However, Ad-infected CLP animals exhibited a greater degree of lung apoptosis than did the CLP group alone. As reported previously, the lung damage in bacterial infections is correlated with an increase in the lung permeability (16). Therefore, the LPI was used as an indication of acute lung damage. Animals in the CLP and Ad.CLP groups lost ∼5% of total body weight in 24 h, but there was no difference in total body weight between the two groups (data not shown). Interestingly, the increase in the LPI of the CLP group compared with that of sham controls was not statistically different at 24 h. The same was true with the Ad-infected sham group (Fig. 3B⇓). However, Ad-infected CLP animals had a greater LPI than did the other groups. CLP increased LPI of animals by 48 h after the operation (data not shown). This suggested that lung damage occurred earlier in the Ad-infected CLP animals than in the CLP alone or Ad alone group; this accelerated lung injury correlated with accelerated mortality. 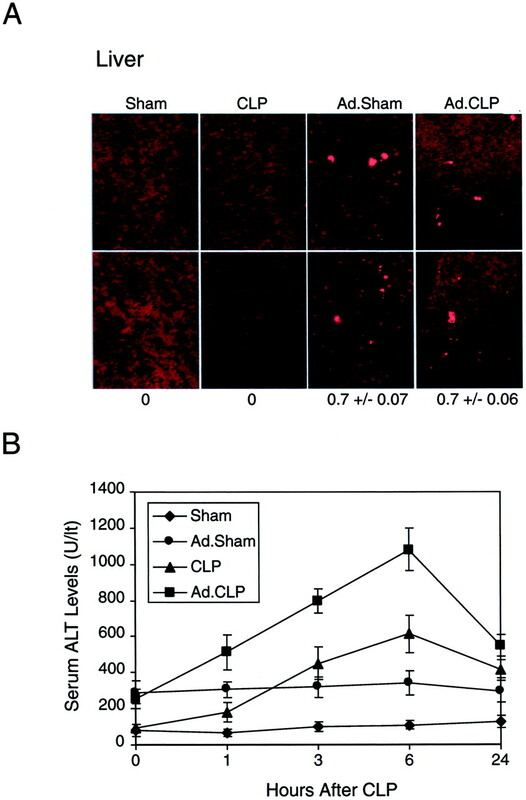 Ad infection combined with CLP exhibited a higher degree of lung apoptosis (A) and lung permeability (B). In situ cell death detection assays were performed as described in Materials and Methods. Two representative fluorescent micrographs are provided for each group (n = 4) of animals. Conditions are provided above each panel. The percent apoptotic area is derived from 20 scans from each animal and is displayed below each panel. B, LPI as an indication of lung damage. Data represent the average (±SEM) of eight independent animals. ANOVA followed by Tukey’s multiple comparison test indicates the existence of a statistically significant difference (p < 0.05) between CLP and Ad-infected CLP groups (Ad.CLP). Ad.Sham, Ad infection combined with sham operation; MOI, multiplicity of infection. The severity of sepsis in humans is correlated with the degree of lymphocyte apoptosis (17). To determine the extent of apoptosis, TUNEL assays were performed on tissue sections isolated from either thymus (Fig. 4⇓A) or spleen (Fig. 4⇓B). As seen in Fig. 4⇓A, both CLP alone and Ad-infected sham groups manifested some degree of thymic apoptosis. However, a profound degree of thymic apoptosis was observed in Ad-infected CLP animals. Apoptosis is also observed in the spleens of critically ill septic humans (18) and in septic mice (19). 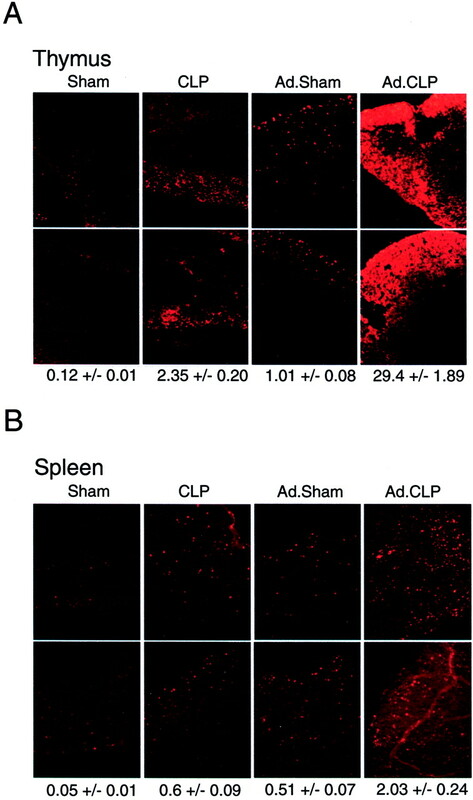 Our TUNEL assays indicated that both CLP and Ad-infected sham groups exhibited apoptosis in the spleen (Fig. 4⇓B). The degree of apoptosis was greater in the Ad-infected CLP group than in the rest of the groups. These results suggest that Ad and CLP alone induce some degree of apoptosis and that the greatest amount of apoptosis is found in the spleen and thymus of the Ad-infected CLP animals. Ad infection and CLP procedure (Ad.CLP) induced apoptosis in thymus (A) and in spleen (B). TUNEL assays were performed as described in Materials and Methods. Two fluorescent photomicrographs are provided for each condition. The percent apoptotic area, derived from 20 scans from each animal, is displayed below each panel. Thymus and spleen of four animals were analyzed in each group. Ad.Sham, Ad infection combined with sham operation. Cytokines play crucial roles in the development of sepsis syndrome (11). A strong correlation between serum TNF-α levels and the severity of sepsis has been reported in septic patients (20). In addition, TNF-α has also been shown to play an important role in the development of multiple organ dysfunction syndrome (21). These results emphasize the importance of TNF-α in the establishment of the sepsis syndrome. Serum TNF-α levels were analyzed by ELISA. We did not observe any detectable levels of TNF-α in the blood of sham operated animals or Ad-infected sham operated animals by ELISA. There was an increase in the serum TNF-α levels of CLP animals (Fig. 5⇓A), which is consistent with previous studies of the CLP model (22, 23, 24). Interestingly, Ad-infected CLP animals exhibited a smaller rise in the serum TNF-α levels after CLP than did the CLP alone group. Therefore, in these studies, an inverse correlation was observed between the serum TNF-α levels and the mortality rates. This observation suggests that the increased mortality in Ad-infected CLP animals might be due to an increase in bacterial infection and not to increased amounts of TNF. 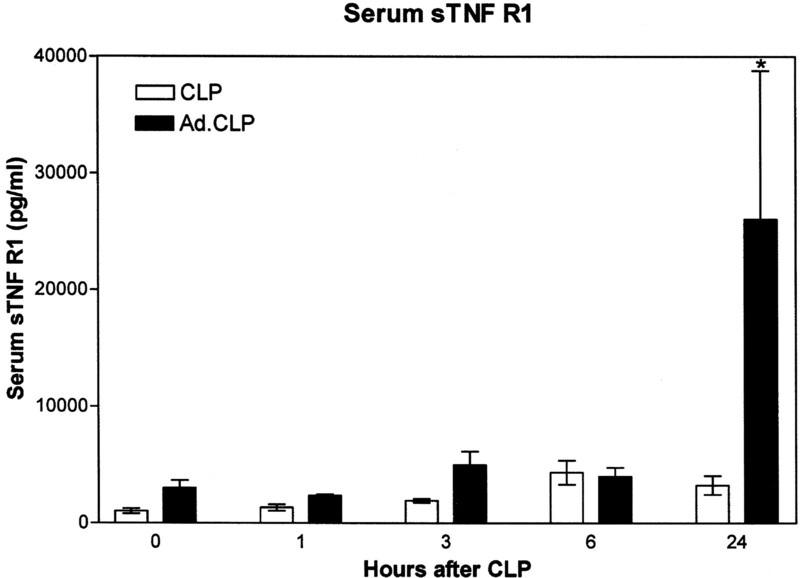 Ad infection decreased CLP-induced serum TNF-α levels (A). Mice were infected with adenoviral constructs 1 wk before CLP procedure. Sera were collected at different time points after CLP operations as indicated on the x-axis. TNF-α concentrations shown in A were detected by ELISA. Ad infection combined with sham operation and sham operated animals did not yield detectable levels of serum TNF-α. Each bar represents a mean (±SEM) of six independent data points. 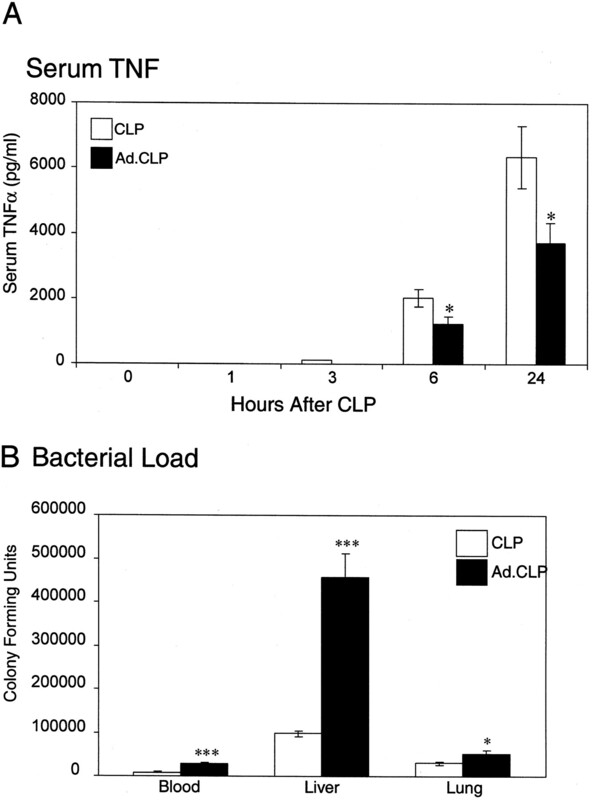 Increased bacterial overload was observed in Ad-infected CLP (Ad.CLP) animals (B). The quantifications of the bacterial load of CLP animals (□) and Ad-infected CLP group (▪) were determined as described in Materials and Methods. The y-axis represents CFU per milliliter of blood or CFU per gram of liver or lung tissue. Data represent the average of (±SEM) of six independent animals. ∗, Statistically significant differences in serum TNF levels between CLP and Ad-infected CLP (Ad.CLP) groups, as determined by ANOVA and Tukey’s multiple comparison test (p < 0.05); ∗∗∗, p < 0.001. To determine whether there was an increased bacterial load after CLP in Ad-infected animals, bacterial load was quantified from three different sources including blood, liver, and the lung. Bacteria were not detected in Ad-infected sham operated animals or the sham group itself (data not shown). Increased bacterial load was observed in the blood, liver, and lung of animals after CLP surgery (Fig. 5⇑B). Interestingly, Ad-infected CLP animals had much greater levels of bacterial load in the blood, liver, and lung. Among these sources, liver had the highest degree of bacterial load. This observation suggests a defect in bacterial clearance in Ad-infected CLP animals. To determine possible causes of the decrease in serum TNF-α in Ad-infected CLP animals, ELISA was used to measure sTNFR1 in serum after CLP. 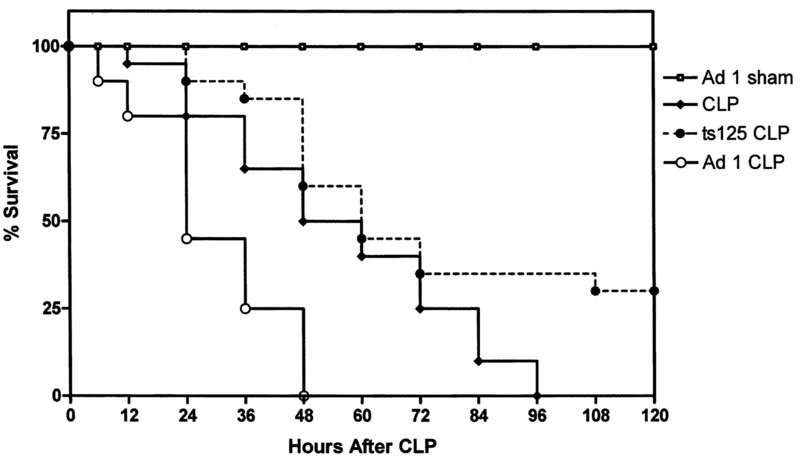 There was an increase in serum sTNFR1 within 24 h of CLP (Fig. 6⇓), which was consistent with prior studies of bacterial sepsis (25, 26). This response was significantly greater in mice previously infected with Ad.LacZ vectors (Fig. 6⇓). These data correlate with the decreased serum TNF-α response seen in Ad-infected CLP animals. Ad infection increased serum sTNFR1 levels. Mice were infected with first-generation adenoviral constructs 1 wk before CLP (Ad.CLP). Sera were collected at different time points after CLP as indicated on the x-axis. sTNFR1 was measured with ELISA, and displayed values are measured in picograms per milliliter. Each bar represents a mean (±SEM) of four animals. At 24 h, Ad-infected animals treated with CLP had significantly higher serum levels of sTNFR1 than those treated with CLP (p < 0.01, ANOVA, Tukey’s multiple comparison test). Liver has been shown to be an important target organ in the CLP model of murine sepsis (14, 27). Kupffer cells are the resident macrophages of the liver and play an essential role in the outcome of sepsis (28). To modify the behavior of Kupffer cells by gene therapy, Kupffer cells likely would be targeted by these vectors. An immunocytochemistry analysis using a Kupffer cell-specific marker (Ly-71) (29) was performed in Ad-infected animals to determine whether first-generation recombinant adenovirus vectors can transduce Kupffer cells. As seen in Fig. 7⇓, A and B, recombinant Ad constructs successfully transduced Kupffer cells. To determine whether there is a loss of Kupffer cells in Ad-infected CLP animals, in situ TUNEL assay was performed before labeling cells with a Kupffer cell-specific marker. 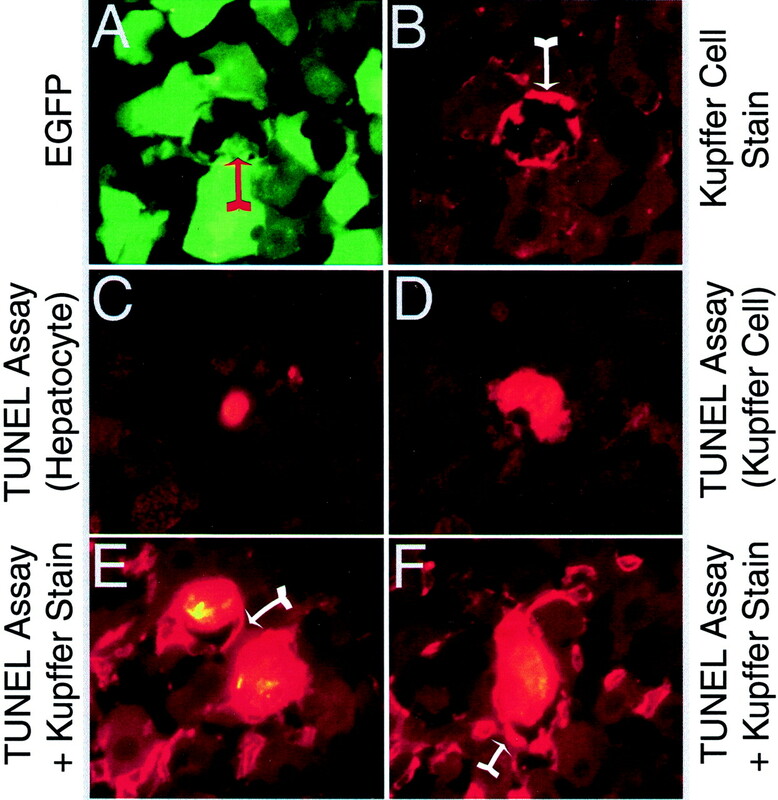 Image quantification determined that 28% of the Kupffer cells exhibited nuclear labeling with the TUNEL assay. This was imaged in 6 animals, with 20 scans per animal; representative images are shown in Fig. 7⇓, E and F. This is in contrast to animals undergoing CLP alone, where no apoptosis was seen in the liver (Fig. 2⇑A). Although it was difficult to quantitate the percentage of Kupffer cells that were EGFP positive, it did appear the majority of these cells expressed the transgene. This result suggested that Kupffer cell loss is at least in part responsible for the decreased clearance of bacteria in Ad-infected CLP animals. Seven-day pretreatment with first-generation recombinant Ad constructs induced Kupffer cell apoptosis in CLP animals. A, FITC channel of a liver section depicting EGFP expression in the cytoplasm of a Kupffer cell (red arrow). B, Texas Red channel of the same field treated with a Kupffer cell-specific biotin-labeled F4/80 mAb (arrow). Because both Kupffer cell-specific stains and TUNEL assays use the same fluorophore, we stained some sections with the TUNEL assay alone. C and D, Apoptotic cells thought to be a hepatocyte (C) and a Kupffer cell (D). Note the presence of just the nuclear labeling but the absence of Kupffer cell-specific circles on these pictures. In addition, both TUNEL assay and Kupffer cell labeling were performed simultaneously to confirm the presence of apoptotic Kupffer cells. Apoptotic Kupffer cells exhibited nuclear labeling and Kupffer cell-specific circles around the cell. These cells are marked with an arrow for clarity (E and F). In summary, we found that recombinant Ad carrying two different reporter genes (EGFP and LacZ) accelerated CLP-induced mortality. This increased mortality was associated with increased tissue injury in lung and liver and marked lymphocyte apoptosis. These are important findings that are associated with severe sepsis in humans. We also found a marked increase in bacterial load in animals exposed to the combination of adenoviral vectors and bacteria (CLP). One potential explanation for the increased bacterial load in these animals was an increase in apoptosis of liver Kupffer cells, which are critical for bacterial clearance. This observation was supported by in vitro studies, which demonstrated more macrophage cell death with exposure to both Ad constructs and bacteria. Additionally, increased serum sTNFR1 may decrease TNF-α activity (30), which may result in decreased bactericidal activity. As an aggregate, these observations suggest that Ad gene therapy constructs worsen sepsis by a number of important, distinct mechanisms. During the course of sepsis, several proinflammatory cytokines, including TNF-α are produced (31). Interestingly, a strong correlation between the serum TNF-α level and the severity of sepsis has been reported in septic patients (20). As previously reported, limited amounts of TNF-α are sufficient to control most bacterial infections (32, 33). Yet, overproduction of TNF-α leads to a lethal inflammatory response and increased mortality (34, 35). Therefore, modulation of the magnitude of the TNF-α response appears to play a critical role in the final outcome of a bacterial insult (31). For this reason, serum TNF-α levels were monitored in our studies. A significant increase in the serum TNF-α levels is detected with CLP. Intriguingly, Ad-infected CLP animals exhibited lower levels of TNF-α than did the CLP group alone. The decreased TNF-α seen in Ad-infected CLP animals may be due to several factors. It has been suggested that serum cytokines represent an overflow from the most affected organs (36); therefore, the observed loss of Kupffer cells in the livers of Ad-infected CLP animals may lead to decreased serum levels of TNF-α. Previous studies have shown mast cells have an important role in the TNF-α response to CLP (37). It is possible that adenoviral vectors adversely affected mast cell function in our studies. Finally, our observation of decreased serum TNF-α may be due to an increase in sTNFR1. There may also have been a loss of macrophages in other sites in these animals. It was not surprising to show that the mortality of CLP was worsened by previous viral infection. First-generation adenoviral vectors have been shown to stimulate TNF-α production (38). One might hypothesize that two infectious insults might stimulate excessive TNF-α and therefore increase organ injury. However, it was intriguing that the increased mortality was associated with a decrease in serum TNF-α. Recent studies have shown that adenoviral constructs aimed at decreasing TNF production have led to improved mortality in zymosan-induced multisystem organ failure (3). We therefore sought an alternate explanation for the increased mortality in the CLP animals exposed to Ad constructs. One explanation of the accelerated mortality in the CLP animals exposed to Ad constructs is a greater severity of sepsis. This is supported by observations showing increased bacterial load in these animals. We were also able to show that this adenoviral construct exposure had greater toxicity to macrophages than did the controls both in vivo and in vitro. Macrophages, especially in the liver, are important for bacterial clearance. Although live first-generation adenoviral vectors significantly accelerated mortality following subsequent CLP, both UV inactivation and ts125LacZ negated this effect. Therefore, the effects are likely a result of viral gene expression. First-generation vectors are E1 and E3 depleted, rendering them unable to replicate, but some viral protein expression still occurs (10). First-generation vectors are commonly contaminated with replication-competent virus (arising through recombination between vector and producer cell DNA sequences) (39), which induces further inflammatory responses in recipients of gene therapy. This has stimulated many investigators to create advanced generations of adenoviral vectors for potential gene therapy. Indeed, the second-generation vectors used in our studies did not accelerate CLP induced mortality. This implies that E2a-regulated adenoviral gene expression stimulated the changes observed in sepsis after adenoviral infection. This finding may provide further support for the use of advanced-generation adenoviral vectors in clinical trials using gene therapy in the setting of sepsis. It has also been suggested that lymphocyte depletion via apoptosis may also be a major determinant of sepsis-induced mortality in critically ill patients (17). In accordance with these reports, our results showed greater apoptosis of lymphocytes in thymus and spleen in CLP animals exposed to adenoviral constructs. Intriguingly, Ad infection itself generated a low level apoptosis in these tissues. These observations suggest that one mechanism, for the increased mortality found in CLP animals infected with adenoviral constructs, might be a profound loss of lymphocytes. Finally, CLP animals exposed to Ad had greater evidence of lung and liver parenchymal injury, suggesting another mechanism for increased mortality. The specific mechanism of the increased cellular killing with Ad vectors and CLP is not addressed in this study. The relationships among TNF-α, sTNFR1, and bacterial load are complex. TNF-α is a major stimulus for the production of sTNFR1 (26, 40). In low concentrations, sTNFR1 may stabilize TNF-α; whereas at higher concentrations, the receptor acts mainly as an inhibitor of TNF function (30). Furthermore, it has been suggested that serum levels of TNF-α may not reflect tissue levels of TNF-α (41, 42). Subsequently, systemic inflammation may be represented more accurately by sTNFR1 than by TNF-α (43). However, our findings of increased sTNFR1 and decreased TNF-α clearly represent a state of immunosuppression, as evidenced by the increase in bacterial load. The stimulus for this state of immunosuppression is not clear but is affected by the previous Ad vector infection. Ad is a potent stimulator of TNF-α (44) and could therefore indirectly stimulate sTNFR1. However, sTNFR1 is not constitutively increased after Ad infection, as evidenced by low levels at early time points after CLP. However, with prior adenoviral infection, sTNFR1 markedly increases after CLP. Whether this represents increased transcription, translation, or shedding of cellular receptors into the circulation is not yet known. Many studies have focused on techniques to reduce systemic TNF-α in the setting of sepsis, in that it is likely an early contributor to systemic injury (41, 45). However, techniques that limit the immune response in sepsis may render the patient more susceptible to infection (46, 47). Overall, these studies suggest that first-generation adenoviral gene therapy vectors accelerate mortality associated with sepsis in an animal model. These studies did not address toxicity of adenoviral vectors that are delivered locally to various tissues. They do suggest, however, that caution might be necessary if these agents are delivered systemically to human subjects. We thank Bora Dinc, Kelli Cameron, and Linda Powers for technical assistance. ↵1 This work was supported by a Veteran’s Administration Merit Review grant and by National Institutes of Health Grants ES-09607 and HL-60316 (to G.W.H.) and by the Center for Gene Therapy of Cystic Fibrosis and Other Genetic Diseases cofunded by the National Institute of Health (Grant P30 DK54759) and the Cystic Fibrosis Foundation (to J.E.). ↵2 K.D. and S.S. contributed equally to this article. ↵4 Abbreviations used in this paper: Ad, adenovirus; CLP, cecal ligation and puncture; EGFP, enhanced green fluorescent protein; Ad.EGFP, Ad vector expressing EGFP; Ad.LacZ, Ad vector expressing Escherichia coli β-galactosidase protein; LPI, lung permeability index; ALT, alanine aminotransferase; sTNFR1, soluble TNFR1.